The other day I talked about decorating a friend's Fine Art Photography studio. Now, across from her desk I would add a seating area. Somewhere where her husband can hang out with her while she's working late. 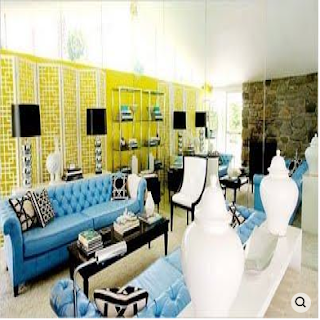 Because she's painting the office a silver sage, I really want to incorporate aqua & citrine accents. These rooms are WAY too bright for our project, but we can achieve a more neutral look by adding the color in with accessories. Plus, these images are fun to look at. 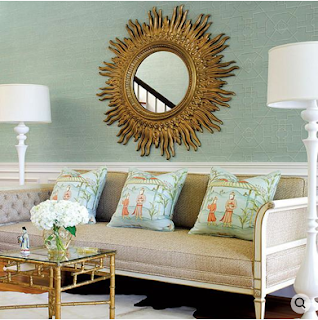 Love this room via House of Turquoise. 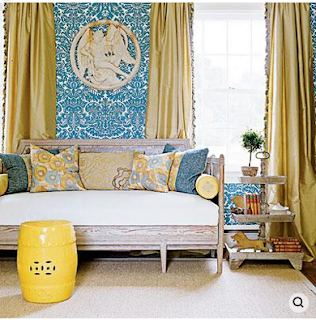 It's still a little bright, but I like how they've tied in the colors in the curtains, garden stool and pillows. 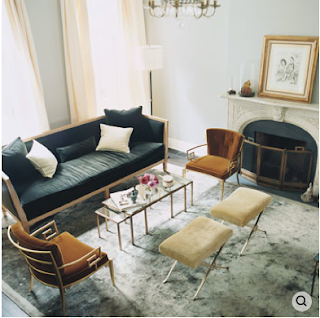 I love the set-up of Katie Lee Joel's living room below. 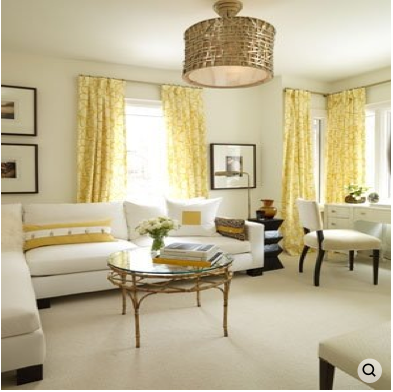 And it's much more of the neutral palette we're going for. 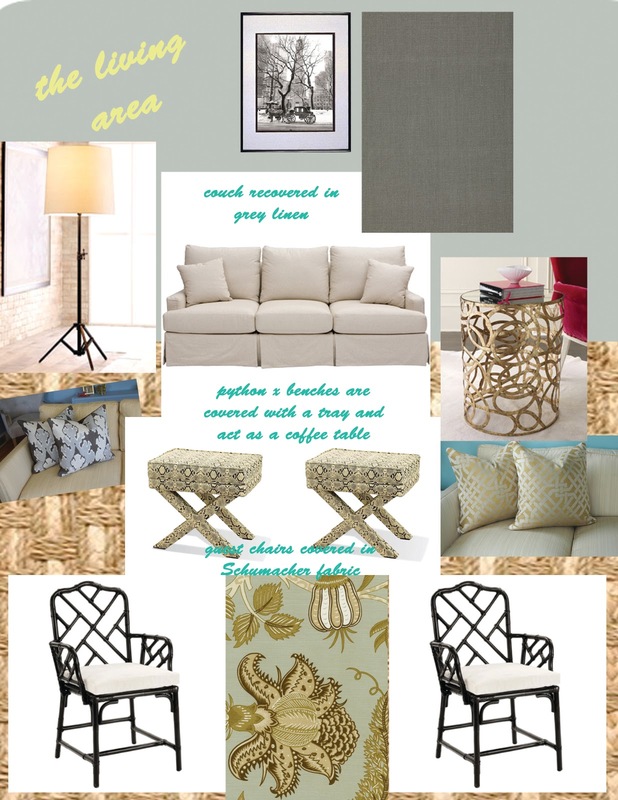 Grey Linen sofa, Artsy floorlamp, gilded side table, python x-benches, black chinese chippendales covered in a pretty teal & beige Schumacher fabric. One thing I didn't add to this board was a metallic cowhide rug. It's definitely something I think we should layer over the seagrass. It will also visually define the "living room" as a separate area. 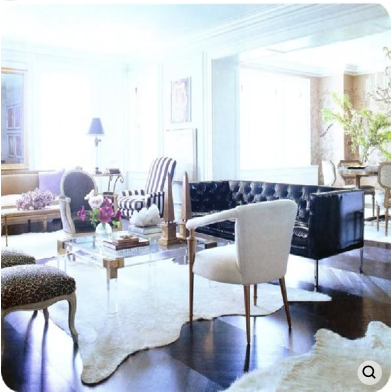 I just love the effect of cowhides on rooms. I would love to add a cowhide like this, white with silver metallic paint!